It was the enchantment of the Outeniqua Forest which led her to her first literary success. She undertook extensive research for her first Forest novel, Kringe in ‘n bos (Circles in Forest) which appeared in 1984. 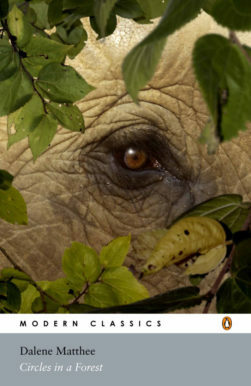 She regularly walked the forest paths with her family, sleeping close to the forest elephants at night. In 1886, 400 to 500 elephant roamed the forest. However, by 1972, only 12 of these magnificent animals were left. What happened to them? Who destroyed them and why? Searching for answers, she stumbled upon a wealth of information and started to write her very first novel on the forest. According to her, she wrote Kringe in ‘n bos (Circles in a Forest) to try and tell the truth about the forest and its elephants. Translated into 11 languages, this book achieved international success. She also won the sought-after ATKV Award. 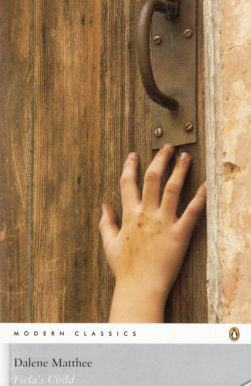 A film – Circles in a Forest – was based on the English translation of the book. 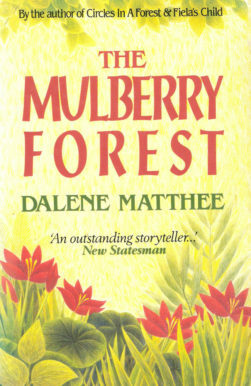 Another two forest books followed: Fiela se kind (Fiela’s Child) (1985) and Moerbeibos (The Mulberry Forest) (1987). Katinka Heyns produced the film of Fiela se kind. 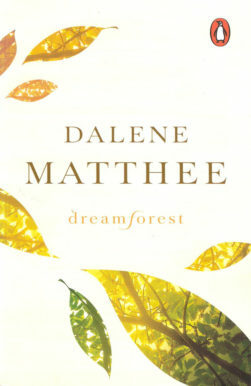 In (Dreamforest (Toorbos , as in Circles in a Forest (Kringe in ‘n bos), Matthee’s intimate knowledge of and insight into the forest, as well as her genuine caring for the trees, flowers and animals of the Knysna Forest once again became evident.